The accident at the Fukushima Dai-ichi nuclear power plant (NPP) in March 2011 led to the release of a large amount of radioactive materials into the environment. Previous research has indicated that exposure to such radioactive materials may have physiological and genetic effects on the Japanese pale grass blue butterfly (Zizeeria maha). Now Joji Otaki and colleagues examine how radiation from the contaminated region around Fukushima may contribute to lifetime ingestion of radionuclides by butterflies, and the potential biological consequences. The authors fed radioactive plant materials from locations around Fukushima to Japanese pale grass blue butterfly larvae from Okinawa – a Japanese prefecture about 1,000 miles south of Fukushima. A massive amount of radioactive materials has been released into the environment by the Fukushima Dai-ichi Nuclear Power Plant accident, but its biological impacts have rarely been examined. Here, we have quantitatively evaluated the relationship between the dose of ingested radioactive cesium and mortality and abnormality rates using the pale grass blue butterfly, Zizeeria maha. When larvae from Okinawa, which is likely the least polluted locality in Japan, were fed leaves collected from polluted localities, mortality and abnormality rates increased sharply at low doses in response to the ingested cesium dose. This dose-response relationship was best fitted by power function models, which indicated that the half lethal and abnormal doses were 1.9 and 0.76 Bq per larva, corresponding to 54,000 and 22,000 Bq per kilogram body weight, respectively. Both the retention of radioactive cesium in a pupa relative to the ingested dose throughout the larval stage and the accumulation of radioactive cesium in a pupa relative to the activity concentration in a diet were highest at the lowest level of cesium ingested. We conclude that the risk of ingesting a polluted diet is realistic, at least for this butterfly, and likely for certain other organisms living in the polluted area. Environmental pollution by artificial radionuclides released from the collapsed Fukushima Dai-ichi Nuclear Power Plant (NPP) has often been evaluated based on radioactivity concentrations in environmental samples collected from the polluted area, such as soil and forest litter1, 2, 3. The accumulation of radionuclides in the bodies of wild and domesticated organisms and in agricultural products has also been documented4, 5, 6, 7, 8, 9, 10, 11. However, the biological impacts of this pollution on the health and disease of wild organisms have not been examined sufficiently. A field study indicated that the abundance of insects, especially butterflies, has decreased12, 13, suggesting that the pollution might have had a fatal effect on butterflies. Another study indicated a high incidence of morphological abnormality in gall-forming aphids14. Consistent with these studies, we have demonstrated that the Japanese pale grass blue butterfly, Zizeeria maha (Yamato shijimi in Japanese), was affected physiologically and genetically in the polluted area, likely due to the artificial radionuclides released from the Fukushima Dai-ichi NPP15, 16. In one of a series of experiments, we have shown a decrease in the survival rate of this butterfly in accordance with the level of radioactivity of cesium in the diet (i.e., the leaves of the host plant, Oxalis corniculata)15, 16 under our standard rearing conditions17. In this experiment, host plant leaves were collected from 5 different localities with different pollution levels (Ube, Hirono, Fukushima, Iitate-flatland, and Iitate-montane) (Table 1) and were given to larvae that were obtained in the laboratory from field-caught females from Okinawa15, which is likely the least polluted locality in Japan. However, the amount of food and the dose of artificial radioactive cesium ingested by these larvae remain to be determined. Furthermore, the amount of radioactivity retained and accumulated by pupae has not been examined. In the present study, we quantified the amount of radioactive cesium consumed by larvae over their lifetimes. Based on these data, simple mathematical models were employed to obtain the radioactive cesium doses resulting in a 50% mortality rate and a 50% abnormality rate. We also quantified how much radioactive cesium was retained and accumulated in pupae. Finally, we discussed the possible risks of a polluted diet for butterflies and other organisms living in the polluted area. We first investigated the leaf weight consumed by larvae in the larval stage (Fig. 1). Dietary consumption curves for 5 larvae were largely sigmoidal: approximately 4 days before reaching the 100% consumption level, the amount of ingested leaves increased dramatically. There was variability in the total amount ingested among the 5 individuals; we recorded 0.304, 0.342, 0.391, 0.318, and 0.279 g (mean ± SD = 0.327 ± 0.038 g; n = 5) for the total weight of host plant leaves eaten by each larva (Fig. 1). However, the shapes of these dietary consumption curves were essentially similar to one another, indicating that our feeding process in which we quantified the weight of ingested leaves did not considerably disrupt the overall growth patterns of the larvae. Within 24 hours after pupation, the weights of all 5 pupae were also recorded; we recorded 0.023, 0.028, 0.033, 0.035, and 0.026 g pupal weight (mean ± SD = 0.029 ± 0.004 g; n = 5). These 5 pupae were smaller than other pupae reared under standard conditions using leaves from Ube, a control locality (mean ± SD = 0.035 ± 0.005 g; n = 154). This difference is most likely due to larval stress resulting from the above rearing conditions, which were necessary to quantify the ingested leaves. Only one piece of leaf was given at a time and replaced daily, and each larva was confined to a small airtight container (see Methods). The leaf weight ingested by an average larva reared under the standard conditions was calculated to be 0.389 g per larva based on a linear adjustment according to the mean pupal weight under the standard conditions, 0.035 g.
Each curve represents an individual larva. The day when a hatched larva was detected was defined as day 1. Using the summation of the radioactivity of 137Cs and 134Cs detected in host plant samples from 5 localities15, we calculated the cumulative radioactive cesium doses ingested by larvae throughout the larval stage; 0.00038 (Ube), 0.58 (Hirono), 2.8 (Fukushima), 3.3 (Iitate-flatland), and 16 (Iitate-montane) Bq (Table 1). Averaged over 5 individuals, the larva in this experiment ate a small amount of non-contaminated leaves (2.8% of the total weight of leaves) before eating contaminated leaves, which was taken into account to calculate the cumulative doses above. The average dose rates per day per larva were also calculated, given that the average larva began ingesting contaminated leaves on day 6 and required 12 additional days to reach 100% consumption (Table 1). In reference to mortality rates and abnormality rates of 5 groups that ingested leaves from Ube (n = 154), Hirono (n = 85), Fukushima (n = 108), Iitate-flatland (n = 100), and Iitate-montane (n = 103) (Table 1), we next examined possible relationships between the dose of ingested cesium per larva and the mortality and abnormality rates (Fig. 2). Both the mortality and abnormality rates increased sharply, especially at low doses, until the ingested cesium dose reached approximately 3 Bq, above which rates did not change notably. Because the plot for the Iitate-montane group was located in the plateau phase, we tentatively excluded it to obtain a mathematical model. Indeed, inclusion of the Iitate-montane plot made any models examined less fit (data not shown). The remaining plots were approximated very well using power functions: y = 42x0.28 or Y = 0.28 (±0.01) X + 1.6 (±0.03) on logarithmic scales with R2 = 0.9945, RMSE (root-mean-square error) = 0.047, F = 3.6 × 102, df = 3 (also in all other models examined hereafter), and p = 0.0027 for the mortality rate, and y = 54x0.28 or Y = 0.28 (±0.002) X + 1.7 (±0.003) on logarithmic scales with R2 = 0.9999, RMSE = 0.0068, F = 1.73 × 104, and p < 0.0001 for the abnormality rate. Insets are plots of four localities that were fitted by power functions (red broken lines). Therefore, based on the power function equations, the half lethal dose and the half abnormal dose (y = 50) were calculated to be 1.9 (±0.02) and 0.76 (±0.02) Bq per larva, respectively. Using the mean pupal weight under standard conditions (0.035 g), these half doses of cesium corresponded to 5.4 (±0.06) × 104 and 2.2 (±0.06) × 104 Bq per kilogram body weight, respectively. Similar calculations yielded the half lethal dose rate (daily dose) and the half abnormal dose rate (daily dose) of cesium ingestion, assuming that a larva consumed contaminated leaves over 12 days, which were 0.16 (±0.002) and 0.063 (±0.002) Bq/d per larva, respectively. These half dose rates corresponded to 4.6 (±0.06) × 103 and 1.8 (±0.06) × 103 Bq/d per kilogram body weight, respectively. Assuming that larvae eat leaves with a constant contamination level throughout life, we calculated the critical contamination levels of leaves to attain the half lethal and abnormal doses when ingested. These critical concentrations were obtained simply by dividing the half lethal and abnormal doses by the amount of leaves consumed throughout life, 0.389 g, yielding 4.9 (±0.05) × 103 and 2.0 (±0.05) × 103 Bq per kilogram leaf, respectively. To examine how much radioactive cesium was retained in the body of the pupae, we measured the cesium radioactivity of dead pupae that never eclosed under our standard rearing conditions (Table 2). The summation of 137Cs and 134Cs activity concentrations per pupa showed that the pupae that ate Hirono leaves (1.32 mBq) had higher values than the pupae that ate Fukushima leaves (1.03 mBq), although the dose ingested by the Hirono pupae (0.58 Bq) was lower than that ingested by the Fukushima pupae (2.8 Bq). Furthermore, the Iitate-flatland pupae had the highest radioactivity (2.36 mBq), which was roughly twice as much as those of the Hirono and Fukushima pupae. Surprisingly, the Iitate-montane pupae showed the lowest radioactivity (0.61 mBq) among the examined pupae, except for the control Ube sample (Table 2). The Ube sample was considered to have a cesium activity of 0. In this paper, we focused on the biological effects of ingested materials containing radioactive cesium species released by the Fukushima Dai-ichi NPP accident. We found that the levels of ingested cesium from the 4 localities (i.e., Hirono, Fukushima, Iitate-flatland, and Iitate-montane) were much higher than that from Ube, a control locality; thus, it is not surprising that harmful biological effects were clearly detected in previous studies15, 16. However, we do not know if our results can be directly compared to other studies on natural radiation or other nuclear accidents. We measured the amount of cesium radioactivity retained in pupae, which could affect metamorphosis, resulting in morphological abnormalities and death16. However, it should be noted that the activity concentrations of cesium in pupae may not be proportional to the degrees of physiological and genetic damage of those pupae. The cesium radioactivity concentration in pupae was much lower than that in the host plant, showing that no bioaccumulation took place in this producer-consumer system that plays a role in an ecological food chain. We found that changes in the overall mortality and abnormality rates in response to amounts of ingested radioactivity were not linear. Rather, the mortality and abnormality rates increased sharply, especially at low doses. Additionally, there seemed to be no threshold level below which no biological response could be detected. These results are consistent with the linear no-threshold (LNT) model, which is relatively widely accepted at low doses18, 19, in that there was no threshold detected in our system. However, the results may be inconsistent with the LNT model in that a linear model may not be appropriate for our system. More precisely, the power function fit for the dose-response data suggests that the relatively small level of artificial cesium from the Fukushima Dai-ichi NPP may be significantly toxic to some individuals in butterfly populations, although we do not know whether the relatively “low-level” radiation in our experimental system is in the range of the levels safely applicable to the LNT model. Nevertheless, we assert that the half lethal and abnormal doses we obtained were quite high. Moreover, the critical concentrations of cesium resulting in the half lethal and abnormal doses, 4.9 (±0.05) × 103 and 2.0 (±0.05) × 103 Bq per kilogram leaf, respectively, appeared to be very high compared to naturally occurring radioactivity levels. These results can be interpreted to suggest that the pale grass blue butterfly is generally resistant to internal radiation exposure. The possible biological impacts of much lower radiation levels will be the subject of future investigations. The relevance of our results to humans remains undetermined and will remain so because of the impossibility of controlled experiments in humans. However, it should be noted that we sampled contaminated leaves from Fukushima City, which many people inhabit as though nothing had happened, and from Hirono Town, which some people returned to inhabit. Moreover, our results are consistent with the previous human results after the Chernobyl accident, in which infant mortality rate increased sharply in West Germany20 and in the United States21. Gould and Sternglass (1989)21 speculated that the increased infant mortality rate immediately after the Chernobyl accident may have been caused by the ingestion of radioactive iodine. Although they used a logarithmic model rather than a power function model to fit their dose-response relationship, both models share a sharp non-linear increase at low doses. Implications of the half lethal and abnormal doses we obtained in the present study will impact future discussions on the effects of radioactive exposure on other organisms, including humans. We found that cesium radioactivity in Hirono pupae was relatively high, despite Hirono leaves having the lowest level of contamination among those examined. Interestingly, cesium activity in the Iitate-montane pupae was the lowest observed, except for the control Ube pupae, despite consuming leaves with the highest level of contamination observed. The Hirono pupae, which ate leaves with relatively low-level contamination among those sampled, had the highest retention and accumulation values. One possibility is that the epithelial cells of the digestive tract of larvae that ate the highly contaminated Iitate-montane leaves became damaged, preventing the absorption of radioactive cesium. Alternatively, the digestive tract may have effectively expelled the excessively high dose of cesium, resulting in the absorption of a limited amount. The latter possibility is more likely, as no systematic reduction of body weight or wing size, which might result from digestive tract damage, was observed in the Iitate-montane group15. Indeed, the latter possibility may be likely if cesium was ingested as microparticles22 adsorbed onto the surface of host plant leaves. In contrast to the Iitate-montane group, the larvae that ate Hirono leaves appeared to have effectively absorbed the radioactive cesium. This scenario explains not only the sharp increase of the mortality and abnormality rates at low doses but also the saturated mortality and abnormality rates at high doses. The saturation of the mortality and abnormality rates may also be explained by a possible exhaustion of relevant targets such as functional genes that cause immediate lethal or abnormal effects when damaged. Such genes may be limited in number, and further hits at these genes do not contribute to an increase in the mortality and abnormality rates. The biological impacts of internal radiation exposure on larvae may be relatively high, considering the fact that the artificial cesium emits not only γ-rays but β-rays23. Additionally, the radioactive plume may have been ingested as microparticles22, causing immune responses (or other physiological responses) independent of radiation, eventually leading to pathological outcomes. There is also the possibility that other radioactive (and even non-radioactive) materials from the Fukushima Dai-ichi NPP, other than cesium, could contribute additively to butterfly mortality and abnormality. Few available studies have evaluated the biological effects of internal radiation exposure in various organisms24, but it has been shown that different species have different sensitivities to radiation exposure25. We speculate that sensitivity likely varies widely under different genetic and environmental conditions, even within a single species. In this internal exposure experiment, we observed that even under the dosage conditions where many individuals died, other individuals survived normally. That is, the mortality and abnormality rates never reached 100%, indicating individual variability of sensitivity within a species. Because such intraspecies variation likely exists in humans as well as in other organisms, setting a single threshold for a “safe exposure level” requires clearly stated confidence intervals along with other relevant information on the system of interest. One recent study reported no detectable effect of radioactive cesium on bull testes26. However, it is premature to draw conclusions from that study, primarily because only two individuals were examined. Furthermore, sperm morphology was shown to be normal by images of only a few sperm nuclei and acrosomes, and the number of germ cells examined was not presented. Above all, negative data should generally be treated carefully, because careful definition of the experimental system and a large number of samples are required to demonstrate a null hypothesis27, 28. To harvest eggs, 6 females and 6 males caught in the field in Okinawa Island were confined to a 300-mm cubic container for 6–10 days as described previously15, 16. During this period, dead adults were replaced with live ones to keep the number of adults unchanged. The obtained eggs, larvae, and pupae were reared in the laboratory under standard conditions17. The diet from Okinawa (i.e., the non-contaminated leaves of the host plant, Oxalis corniculata) was given to all larvae initially, and on the 6th day after hatching, the initial larval population was randomly divided into 5 groups. Therefore, these groups were genetically identical to one another. Each group of larvae was fed a diet collected from one of the 5 localities (Ube, Hirono, Fukushima, Iitate-flatland, and Iitate-montane) from the 6th day after hatching15. Non-polluted leaves from Ube, Yamaguchi Prefecture, were fed to a group of larvae. This group of larvae served as a control for the internal exposure experiment. Eggs were harvested from females caught in the field in Okinawa as above, and 5 larvae were randomly chosen and reared at ambient temperature (approximately 27°C), each in a plastic columnar centrifuge tube with an airtight screw cap (10 mm in diameter and 50 mm in height) to prevent leaves from drying. The quantity of leaves eaten by each larva was monitored every day. One piece of leaf removed from the stalk was supplied at a time. Before being given to a larva, the leaf piece was weighed. Additionally, its image was taken by an image scanner, and its area was measured using the ImageJ 1.44p software (U. S. National Institutes of Health, Bethesda, Maryland, USA, http://imagej.nih.gov/ij/, 1997–2012). After being eaten, the remaining leaf was replaced every day with a fresh leaf. The area of the remaining leaf was measured every day, and its value was converted into weight, based on the proportion of the original leaf represented by the remnant. This process ensured that the weight eaten each day was recorded as the weight of the fresh leaf. Cesium radioactivity (both 137Cs and 134Cs) in leaf samples was measured with a germanium semiconductor radiation well-type detector Canberra GCW-4023 (Meriden, CT, USA) with a heavy shield of lead after ashing the samples as described previously15.Using cesium radioactivity values of the leaves at the time of measurement (26 December 2011), presented in Supplementary Table 8 in Hiyama et al. (2012)15, we recalculated the values at the time of larval consumption (fixed at 22 July 2011 for simplicity), assuming that 137Cs and 134Cs were released at a 1:1 activity ratio in a single burst on 15 March 2011 from the Fukushima Dai-ichi NPP. The Hirono 134Cs value, 5.38 (±0.06) × 102, was amended due to a typing error in the original paper15. The same detector was used to measure cesium activity (137Cs only) in pupae. This well-type detector provides maximum efficiency for small samples, because samples can be inserted into a well. Before measurement, dead pupae were air-dried for several months and placed in a columnar plastic container (14 mm in diameter). The detector was calibrated with a standard prepared from the NBL powder standard (New Brunswick Laboratory, U.S. Department of Energy, Argonne, IL, USA). Measurements were performed until the error rate scored less than 10%. Measurements were assumed to be made simultaneously on 15 February 2014 for simplicity, although several days were required to obtain reliable levels of radioactive signals from the pupae. Radioactivity per pupa at the time of ingestion was calculated, assuming that 137Cs and 134Cs were released in a single burst on 15 March 2011 at a 1:1 activity ratio and that all leaves were eaten simultaneously at once on 22 July 2012. 134Cs activity was calculated based on a 134Cs:137Cs activity ratio at the time of ingestion, fixed at 22 July 2011 for simplicity. We first used the built-in mathematical fit function of Microsoft Excel (2013) to obtain the best-fit curves among available models. All possible models were examined including linear, exponential, logarithmic, polynomial, and power function models, and the best possible fit in terms of R2 values and biological justification was considered to be the most appropriate. Based on equations obtained in this way, we manually calculated the half lethal dose and the half abnormal dose by setting y = 50(%). Additionally, linear and nonlinear models were examined using the model analysis software JMP 11.0.0 (2013) (SAS Institute, Cary, NC, USA). We reasoned that the simplest mathematical equation with the highest R2 value, the lowest RMSE, or the lowest information criterion, such as AIC, BIC, and MDL, would be accepted. We examined linear models (including logarithmic scales for power function) and nonlinear models (including logarithmic, square root, quadratic, polynomial, logistic, and exponential equations). Among the model fits performed, logistic 4 P models also showed high R2 values (R2 = 0.9972 and BIC = 19.93 for mortality rate; R2 = 0.9997 and BIC = 12.31 for abnormality rate) in addition to the power function models, but the complicated equations with relatively high BIC values discouraged the use of these equations for further analysis. The numerical values associated with the models and calculations are shown together with standard errors (SE) in the main text. Hashimoto, S., Ugawa, S., Nanko, K. & Shichi, K. The total amounts of radioactively contaminated materials in forests in Fukushima, Japan. Sci. Rep. 2, 416 (2012). Koarashi, J. et al. Retention of potentially mobile radiocesium in forest surface soils affected by the Fukushima nuclear accident. Sci. Rep. 2, 1005 (2012). Hosoda, M. et al. Activity concentrations of environmental samples collected in Fukushima Prefecture immediately after the Fukushima accident. Sci. Rep. 3, 2283 (2013). Kakiuchi, H. et al. Concentration of 3H in plants around Fukushima Dai-ichi Nuclear Power Station. Sci. Rep. 2, 947 (2012). Sasaki, K. et al. Radiocesium distribution in the tissues of Japanese Black beef heifers fed fallout-contaminated roughage due to the Fukushima Daiichi Nuclear Power Station accident. Biosci. Biotechnol. Biochem. 76, 1596–1599 (2012). Tagami, K., Uchida, S., Ishii, N. & Kagiya, S. Translocation of radiocesium from stems and leaves of plants and the effect on radiocesium concentrations in newly emerged plant tissues. J. Environ. Radioact. 111, 65–69 (2012). Fukuda, T. et al. Distribution of artificial radionuclides in abandoned cattle in the evacuation zone of the Fukushima Daiichi nuclear power plant. PLoS ONE 8, e54321 (2013). Isogai, E. et al. Distribution of radioactive cesium in ostrich (Struthio camelus) after the Fukushima Daiichi nuclear power plant accident. Radiat. Emerg. Med. 2, 68–71 (2013). Hayama, S. et al. Concentration of radiocesium in the wild Japanese monkey (Macaca fuscata) over the first 15 months after the Fukushima Daiichi nuclear disaster. PLoS ONE 8, e68530 (2013). Mizuno, T. & Kubo, H. Overview of active cesium contamination of freshwater fish in Fukushima and Eastern Japan. Sci. Rep. 3, 1742 (2013). Nakanishi, T. M. & Tanoi, K. Agricultural Implications of the Fukushima Nuclear Accident (Springer Japan, Tokyo, 2013). Møller, A. P. et al. Abundance of birds in Fukushima as judged from Chernobyl. Environ. Pollut. 164, 36–39 (2012). Møller, A. P., Nishiumi, I., Suzuki, H., Ueda, K. & Mousseau, T. A. Differences in effects of radiation on abundance of animals in Fukushima and Chernobyl. Ecol. Indicat. 24, 75–81 (2013). Akimoto, S. Morphological abnormalities in gall-forming aphids in a radiation-contaminated area near Fukushima Daiichi: selective impact of fallout? Ecol. Evol. doi:10.1002/ece3.949 (2014). Hiyama, A. et al. The biological impacts of the Fukushima nuclear accident on the pale grass blue butterfly. Sci. Rep. 2, 270 (2012). Hiyama, A. et al. The Fukushima nuclear accident and the pale grass blue butterfly: evaluating biological effects of long-term low-dose exposures. BMC Evol. Biol. 13, 168 (2013). 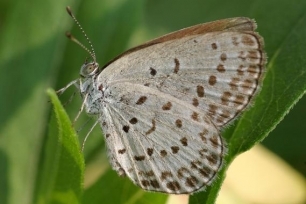 Hiyama, A., Iwata, M. & Otaki, J. M. Rearing the pale grass blue Zizeeria maha (Lepidoptera, Lycaenidae): Toward the establishment of a lycaenid model system for butterfly physiology and genetics. Entomol. Sci. 13, 293–302 (2010). Sinclair, W. K. The liner no-threshold response: Why not linearity? Med. Phys. 25, 285–290 (1998). Calabrese, E. J. Origin of the linearity no threshold (LNT) dose-response concept. Arch. Toxicol. 87, 1621–1633 (2013). Lüning, G., Scheer, J., Schmidt, M. & Ziggel, H. Early infant mortality in West Germany before and after Chernobyl. Lancet 334, 1081–1083 (1989). Gould, J. M. & Sternglass, E. J. Low-level radiation and mortality. Chemtech 19, 18–21 (1989). Adachi, K., Kajino, M., Zaizen, Y. & Igarashi, Y. Emission of spherical cesium-bearing particles from an early stage of the Fukushima nuclear accident. Sci. Rep. 3, 2554 (2013). Endo, S. et al. Estimation of β-ray dose in air and soil from Fukushima Daiichi Power Plant accident. J. Rad. Res. doi:10.1093/jrr/rrt209 (2014). Møller, A. P. & Mousseau, T. A. Low-dose radiation, scientific scrutiny, and requirements for demonstrating effects. BMC Biol. 11, 92 (2013). Møller, A. P. & Mousseau, T. A. The effects of natural variation in background radioactivity on humans, animals and other organisms. Biol. Rev. 88, 226–254 (2013). Yamashiro, H. et al. Effects of radioactive caesium on bull testes after the Fukushima nuclear plant accident. Sci. Rep. 3, 2850 (2013). Fisher, R. S. The Design of Experiments. Eighth Edition. (Oliver and Boyd, London, 1966). Cohen, J. Statistical Power Analysis for the Behavioral Sciences. Second Edition. (Lawrence Erlbaum Associates, Hillsdale, NJ, 1988). We thank J. Nohara (Tokyo), M. Hatta (Ube), J. Ishida (Okuma), N. Itou (Iitate), K. Yoshida (Minami-soma), and K. Nakanome (Minami-soma) for their help in collecting host plant leaves, and S. Gima (University of the Ryukyus) for technical help. This work was supported in part by the Grant for Environmental Research Projects from The Sumitomo Foundation, Tokyo, Japan, and by the Incentive Project from the University of the Ryukyus. J.M.O. designed and coordinated the study and performed mathematical modeling; C.N., A.H., W.T. and A.T. performed experiments; C.N., A.H., W.T., A.T. and J.M.O. analyzed data; and J.M.O. wrote the paper.